As I look back over my journey as an entrepreneur, I find that there are times when I felt like I was on fire, things were happening, everything was clicking, etc. And then there are times when I felt defeated, lonely, fearful, and like it was all an uphill battle. When I notice that there are such vast differences between how I feel at different times (even when I’m basically in the same situation that I’ve been in), that reminds me to check in with myself to see if I can figure out why I’m having the feelings I’m having – whether they’re positive or negative. And I’ve made an observation that has been helpful to me, in times when I feel that I’ve stagnated or my progress doesn’t seem as rapid as I’d like. Many times when I’m feeling defeated or negative, and my progress has stalled, I’m not approaching my work from the standpoint of a professional. I’m not going pro. I’ve seen this same situation yield different results in other areas of my life, too. A little over a year ago, I decided that I wanted to get into better shape. Many of my friends are very fitness-minded, and they participate in different types of fitness activities. A few of them have done group events, where you put a team together and compete together. And that sounded like a lot of fun to me. But I wasn’t in very good shape. I realized that if I wanted to have those experiences in my life, I was going to need to get into better shape. So I started running. But I’ve always hated running and felt that I was terrible at it. I’ve pretty much avoided it at all costs because I felt so uncomfortable when I ran. But I knew that if I wanted to be able to participate in a group event with my friends, I HAD to be in better shape, especially in respect to my cardiovascular health. And I felt that running was the key to building that strength. When I started running a few times a week, I hated it. I could barely run 3/4 of a mile without stopping. And it was a HUGE push to make it that far. But as I continued to run, it got a bit easier to go farther. However, feeling motivated to run on a regular basis was still something I didn’t feel. I thought maybe my feelings about it might change if I started telling people that I was running. At first, I started telling people exactly that. “I’ve recently started running.” And I still struggled on each run. Struggled to find the motivation to get out there and make myself suffer yet again. Struggled to feel like I was getting much better. Until one day when I was waiting to pick my son up after school. I was living in a community where the school was pretty close to the house. And the moms in the neighborhood would walk their kids to and from school – and wait for the kids after school at the same corner. The moms would all stand around and talk about mom stuff. It was kind of nice. 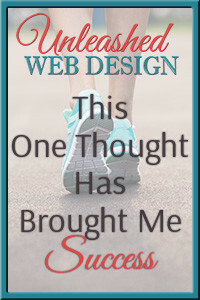 But I digress……..
One day, waiting on the corner at the end of the school day for my son, a group of moms was talking about running. And one of the moms said, “Lori’s a runner. I see her running in the neighborhood in the mornings.” It was the first time in my life that I had been called a runner. I had never identified myself as a runner. I didn’t really identify myself as a runner at that point. But when she called me a runner, I instantly felt differently about myself. Am I a runner? I run. I run often. I AM a runner! As soon as I started calling myself (in my own mind and out loud to others) a runner, I started feeling differently about running. I started running farther and pushing myself harder. I stopped telling myself that I “had been running lately” and started telling myself “I’m a runner.” I went pro. Even if it was only in my own mind. And do you know what? I’m still a runner. So……do I run marathons? Not even close. Am I fanatical? Nope. Am I in peak physical condition? Not really. But I do take my running seriously. I don’t allow myself to skip running (not for many days in a row, anyway). I search for races to run. I seek out advice from other runners on how I can get faster or run longer distances. My whole approach to running has changed. All because I started claiming to BE a runner. I stopped discounting the fact that I was new at it. Even if it didn’t totally feel accurate to call myself a runner, NOT calling myself a runner gave me an out. If I’m NOT a runner, it doesn’t matter if I run or not. It doesn’t matter how many days have gone by between runs. It doesn’t matter if I don’t enter any races. But AS a runner, I can’t NOT do those things. It’s just a mindset shift, but it makes all the difference in the world. The same thing has happened when I adopted that attitude in my business. I used to actually tell people that I was trying to go out on my own and make it as an entrepreneur. TRYING. But I wasn’t an “I am” yet. As soon as I started telling myself, “I’m an entrepreneur. I’m a web designer. I’m a business owner,” my attitude and actions changed. I took my work much more seriously. I planned more. Accomplished more. Earned more. Achieved more. Sought more opportunities for growth and improvement. Invested in myself and my business more. And the same can happen for you. If you CLAIM your stake in this world, you’ll find that you grow into that role much easier and quicker. If you play small, you win small. If you’re starting a business on the side to see if it could be profitable and viable, you won’t truly know unless you treat it as a professional would. Put yourself in a pair of big shoes…….and then fill them. Have you ever shifted your mindset in a way that changed a situation for you in a positive or negative way? Have you ever found that you could achieve more just by believing that you could? I’d love to hear your stories about this! Leave me a comment below and tell me YOUR story! It’s Ed Vaughen. The bass drum slugger fr the 553rd AFB. I finally got around to checking you out…. On your website ya goof! I bagged work today as yesterday was awful. Needed time to clear my head. Think about where I’m going. What k want to be when I grow up. Anyway… Your site looks great!!! I’m way impressed!!! I knew it would be good just from our short talk but you are all pro! If I ever take the entrepreneur plunge I’m absolutely calling you to be my lifeline. PS- greatest hug ever at the end of that weekend! 🙂 hope you have a great holiday!!! Next post: Are you in “the zone”? For goodness sake, get out of it.